If everyone's work is important to God, then it is a problem when the broader work system is broken in a way that keeps people from working in a productive, dignified way. Our responsibility as Christians is not limited to the confines of our job, but we need to look at the larger system of where we work (and sometimes other systems). 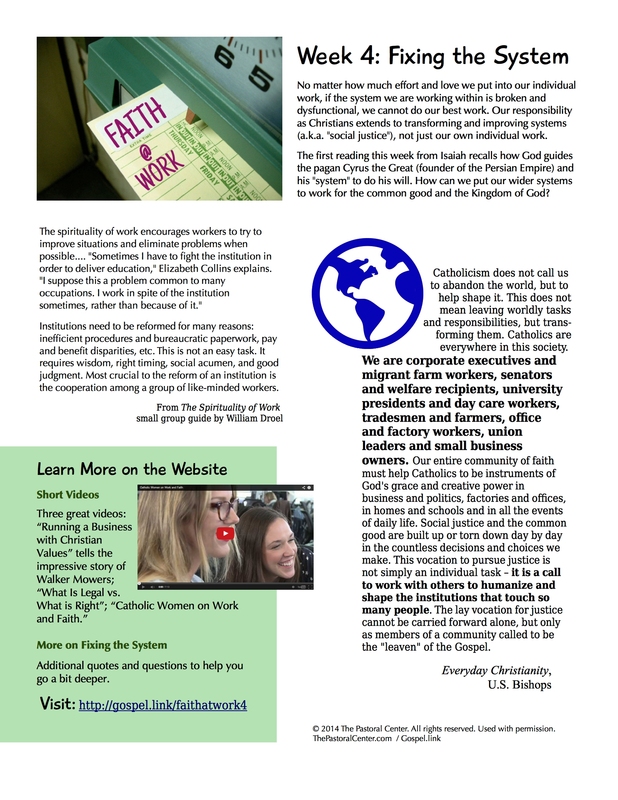 Catholic social teaching informs how we need to improve systems for the good of workers and the broader society. View the week 4 public page for more ideas. The first reading from Isaiah is particularly interesting and topical, as it recalls how God guides the pagan Cyrus the Great (founder of the Persian Empire) and his "system" to do his will. How can we put our wider systems of work to work for the common good and ultimately the Kingdom of God? This is a great opportunity to highlight an Old Testament reading in your preaching or teaching. You do not have to always focus on the Gospel, and it is usually most effective to focus on a single passage. However, the Gospel can also be connected to this topic. One way to read the Gospel this week is as an affirmation of our social responsibility. We may see our job as a Caesar ruling our decisions at times, but what responsibility do we have to God to improve that work system? See the overview above for ways to develop this topic.